Portstewart is an upmarket tourist haven with a spectacular beach, a gorgeous harbour, promenade, championship golf courses, great restaurants, cafes, parks, icecream parlours and even outdoor swimming pools and a childrens pleasure beach. Portstewart has many places where you can relax and watch the world go by. It was a well loved Victorian seaside Port which has retained both its heritage and public appeal. Portstewart is a beautiful Northern Irish Seaside Town with plenty to do for the whole family. This exquisite holiday destination attracts visitors who love to be on the Causeway Coast and are looking for a more peaceful haven, it has a relaxed atmosphere providing a pleasurable escape from life's hustle and bustle. Don't get me wrong there is still plenty to do in Portstewart for children and adults alike and in the summer months you'll be lucky to get a parking space anywhere close to the centre of town as the locals stream in to cruise up and down the Promenade! Family fun...down at the Crescent. Just off the Promenade, Portstewart Crescent has been newly refurbished, and has quite a bit of close-by parking. The fun outdoor play area has paddling pools, boating lake, karting, park, shop, cafe, bandstand, fountain with outdoor covered seating and viewing area. The fountain, the first of its kind in Europe, is comprised of 33 small water jets which are placed in 3 rows of 11. The water 'dances' to music creating a captivating music, water and light show. There are many eateries in Portstewart. The famous 'Morelli's' on the Promenade serves award winning absolutely delicious ice cream in mouthwatering flavours, try a Knickerbocker Glory to be totally impressed!!! It is open everyday from 9am until 10pm with hot food served until 8pm. Morelli's is very popular with locals and visitors, it has been around since the early 1900's. Cromore Halt Inn is another local favourite. This friendly family run Inn, Restaurant and Bar offers delicious food seven days a week, with a vibrant atmosphere and great hospitality. The Anchor Complex leads the way in the Portstewart nightlife scene with the Anchor Bar, Anchor Bistro and Aura Nightclub, frequented by locals and tourists alike. You can dine in the restaurant at Shenanigans on the Promenade, enjoy a drink in the bar and a dance upstairs at Havana Night Club. The Flowerfield Arts Centre, which was the first ever Arts Centre in Northern Ireland, hosts great creative events and concerts. It has Art Enhibitions year round and offers a great range of courses for adults and children like jewellery making, dying, weaving, calligraphy plus lots more . The Victorian Mansion in which it's set was built in 1855, and has a colourful history. Open: 9am to 5pm, Monday to Friday, and 10am to 1pm, Saturday. 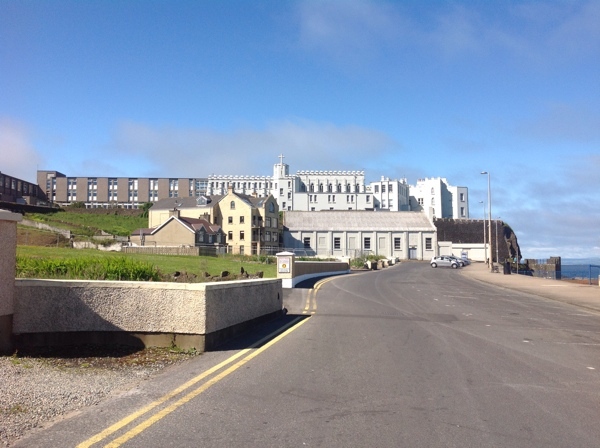 Dominican College, formally O'Hara Castle built in 1834, provides an impressive backdrop from the Portstewart Promenade as you look out to the Atlantic Ocean. Watch the waves come crashing in over the black rocks. Walk the cliff path, which forms part of the Causeway Coast Way, from Dominican College to the Portstewart Strand and take it some of the world's most stunning coastal views. Take in the amazing vista of the beach, the barmouth, Lough Foyle, Donegal and Scotland in the distance. 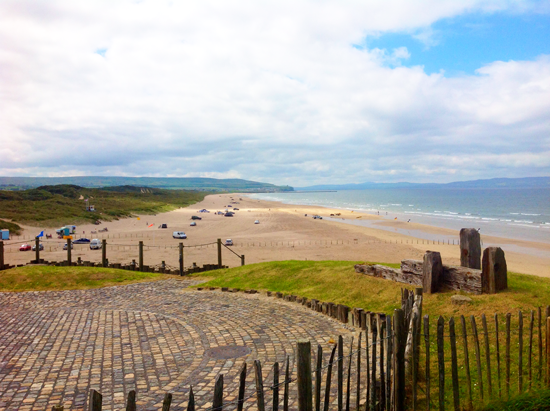 Portstewart Strand is a 2 mile long stretch of stunning Blue Flag Golden Sand Beach. (The Blue Flag is a certification given when a beach meets the highest standards for water quality, safety, environmental education and information.) It's Western boundary is at the barmouth of the River Bann, the Eastern boundary is the Portstewart Golf Club. This is a National Trust beach and one of Northern Ireland's most visited. It is inherently beautiful, with pristine water that is perfect for a swim, paddle board, surf or fish. Enjoy a stroll, jog, horse ride or a walk with your dog at Portstewart Strand. The sand dunes are simply amazing to wander through. Drive or walk along Strand Road to the town centre, The Diamond, or walk across the coastal trail either way you'll come across the impressive Dominican College, once O'Hara Castle, and the stunning views of Portstewart Promenade, Harbour and Strand from this rocky outcrop. Church Road is the top road through town. Drive leisurely around to the second peninsula at Kinora Terrace, Atlantic Circle and Herring Pond, which is a natural deep-water rock pool which is very inviting as a outdoor natural swimming pool. Seeing the sites of the Causeway Coast by sea adds a whole new perspective to their beauty. As land creatures, we tend to keep our feet mostly on the ground, but in the Causeway Coast there are lots of possibilities to explore this spectacular natural scenery in and from the ocean. Take a short or longer cruise or charter a boat to tour you around the coast, the Skerries, Rathlin and beyond. You can also take part in sea angling from a few boats in the harbour. This is sublime walking country. Portstewart Strand is the start of one of the most breathtaking walks, the 33 mile 'Causeway Coast Way'. This will take around 2 days to walk and you will pass the regions most dramatic locations such as the White Rocks, the Giant's Causeway, Dunluce Castle and the Carrick-a-Rede Rope Bridge. Every May the Causeway Coast hosts one of the world's fastest road races, the 'North West 200'. The public roads between Coleraine, Portrush and Portstewart get turned into high-speed (up to 200 mls per hour) tracks, one of the last of its kind in Europe. It's an unbelievably thrilling race to watch, as you stand by the side of the road to get the best views of these powerful fast bikes coming speeding by. It's a busy time for the Causeway Coast, with additional crowds of 150,000 people coming every year to watch Ireland's largest outdoor sporting event. Portstewart Golf Club, founded in 1894, has three 18-hole links courses and is ranked 95th in the 'Top 100 golf courses of the British Isles'. Set amidst imposing sand dunes with panoramic views across the Atlantic mouth of Lough Foyle to the Inishowen peninsula and beyond. Includes 9 new holes running down to the river.